Twenty-four years ago John Updike won the National Book Critics Circle Award for criticism for "Hugging the Shore." This week as "Due Considerations," his sixth volume of assorted criticism, landed in stores, I caught up with him by phone to talk about poetry, learning on the job, his next novel, and his attempts to learn a foreign language. Q: Last time we spoke, you had just turned in this book and thought it might be your longest critical compilation yet. And yet it’s a mere 700 pages – did you do some cutting? A: Yes, how vain of me to think these books would keep growing! But it was in fact less – we did cut out the golf pieces, because I think in the past it was irritating to serious book lovers to find a spread of paeans to golf. But I’m not as prolific as I thought I was. I was even dismayed. But maybe it’s a natural decline and should be welcomed. I actually don’t write reviews at the pace I used to – it used to be once a month, now months can go by and I don’t write one at all. Q: Time being cruelly finite, and since you seem to think of yourself as a novelist, why review at all anymore? A: Maybe I’m scared of what would happen if I had nothing to write but fiction, and I am scared of not ever again being in The New Yorker. I fell in love with the New Yorker as a pre-adolescent, and it gives me a sense of meaningful contact to review for them, to have the exchange of proofs. I am too much of a professional to want to be locked in entirely with one novel after another. Roth does it that way, Styron did it. I like the mix. Q: You have reviewed poets in the past, but less so here – saying you never feel comfortable doing it. Why? You’ve written six or seven collections. A: It’s kind presumptuous. I’ve never been part of the poetry establishment. As you say, there are at least six books, including a collected poems. I began., as many writers do, as a poet, but I feel in a way that I don’t quite get it. I read John Ashbery and don’t quite get it. The poets that I do review in this book, like Larkin, and Shapiro at some length, are out of fashion. I remember Shapiro's poetry as being some of the few so called modern poets I can dig. I can get the environment, and I can feel the America as he was describing it. Q: Does a novelist have an advantage as a critic? As a teller of stories, I would imagine you’d be better at the retelling, theoretically, if not through plot summary. Q: In Picked Up Pieces, you wrote “circa 1960….humorous verse and theology were the only areas where a data-density map of my brain would have shown even a faint darkening..” Are there are any specialties now you feel comfortable wielding? Or as you called it in “Odd Jobs,” "unsuspected wisdom?" A: One would hope of course to get wiser as you get older – I did have those two hobbies of keen reading in my youthful years. I don’t think I have added to them, but I have read a lot of books for review, or even some without it. I think I am fairly much at home in the second half of the twentieth century fiction. But we're not in that century anymore, and I'm not as up on writers under 40 or even under 50 as I should be. The New Yorker editors change and editors-in-chief change and the kind of book you are asked to review changes – just this week I have a longish review of the biography of the creator of the Peanuts. There I was competent to the extent any ex-cartooner would be. Schultz came out of the same hinterland as I and escaped into them and knew the equipment, knew what a Ben Day was, how you write on blue…all kinds of professional lore that’s obsolete now. Q: You used to do some reviewing of your contemporaries – like Philip Roth – but the American section in this book is quite thin. Are you asking for different books? A: I’d rarely in the old days ask to review certain books. I got Publishers Weekly, and I was somewhat up on the book industry, but I no longer get it. So I am subject to what I suggest and what I can handle. I have never been totally comfortable reviewing peers – I feel a little bit guilty for the lukewarm reviews to writers I know and admire, so I am happy to have as few Americans sent my way. It’s always easier to be the guy reviewing the new Eastern European novel or some avant garde play – that was my specialty in the days that I had one in the days of the Shawn. I was one of the only ones willing to read these books and people like that and that was fun. I was relieved of any rivalry and I thought not entirely falsely they might teach me something new, and they did. And I rarely get a book in translation now – Houellebecq was the last, and I am happy to read him…he makes you stop and think and there is something very respectable about that. He says somewhere he is honest. There is a kind of fierce honesty to his work. Q: You have reviewed pretty far a field over the years – especially among far eastern writers. Have they changed at all your sense of the novel? A: I am happy to have read some Japanese and Asian writers, because they provide out of a different world – it freshens your sense of possibility, and human variety and Japanese bring to fiction the same clean edges and economy that you feel in their art. Those were fun to review….not so much with other the two books in Due Considerations I review from China, on the other hand there was a certain spirit, he did give a novelist view of the last 50, 60 years of China, one full of misery. Q: I liked your description of coming back from China to your own house and waking up in the night suddenly alienated by it. A: Travel, like reading other people’s fiction, is a little frightening, you don’t want to know how much exists. It’s a peril of all knowledge, it exposes you to the bewildering muchness of the universe….One writer I reviewed more than once, Pamuk, has been great. I was sort of in to him before he became well known– I was glad to have read him, he is a writer working on the edge of what is possible. Q: You also come back to Ngugi wa Thiong’o, who you have reviewed before – not very positively. You like his new book a little more, but not whole-heartedly. A: I find it a hard book to believe, it’s overtly political, which pains me. I was told by my daughter in-law, who is a Kenyan, that Ngugi liked it – he’s trying to fictionalize the dire conditions of African politics and African leadership, which I thought was terribly broad. You also have to consider there’s a virtue to a book that you are blind to or numb to get though…I try to keep that in mind because so many reviews of my book feel misunderstood. Q: That was one of your central rules to yourself, as you set them out inPicked Up Pieces. To always try to understand what a writer was trying to do: have you added anything to this list? A: Those rules were written by a much younger and cockier writer, but I have purposefully followed them – I do almost all the reviews for a magazine that is willing to indulge long reviews, so I am able to quote more liberally than many, and I appreciate that I have an advantage. Certainly one should create enough of a sample, and allow the reader to make up their own mind without the reviewer getting in the way. Plot summary – we talked about that. Again, try to be open. Is it the novel’s fault or yours? Q: I know you lived for a time in Spain, and traveled in Africa…did you ever, perhaps, consider a foreign language course, so you could read work outside of English? A: If you travel of course you at least get out the Berlitz phrase book, and I’ve tried to teach myself first French then Italian. I took German lessons and Spanish lessons both. Out of all of this I can’t do very much-- maybe I could have a conversation with a very indulgent Frenchman. I did get to the point that I could talk to the Berlitz instructor. I don’t feel I’ve reached the point I could really use any of these languages – but again it’s like peeking into another person’s house, it’s an expansion of your sense of possibility, the way in which they are different, the way in which Italian grammar differs from ours, you think it’s going to be easy, it looks easy and sounds easy, but it is full of grammar that English has let wither. It makes you think of your own language – all the inbuilt rules you never think about. I always thought, among the kinds of books I’d do would include a translation, but I never reached the level of proficiency to do it. I did translate a few poems – I did Russian from a prepared little translation. I knew enough about the alphabet so that I could sound out how the words translate. I did some Borges, almost anything is grist for your mill if you are a fiction writer, including even a bad book, there’s always something that you didn’t know. Q: How do you choose what to review? Do you cull through what the Fed-ex man speeds to your door? Comb catalogs? Review books that relate to what you’re writing? I noticed in here you reviewed Jonathan Safran Foer before publishing Terrorist, as well as Robert Littell – was that background reading at all? A: My faulty memory is that I actually reviewed those books while I was doing Terrorist, but that I had already conceived mostly of the plot, but it did interest me to read a thriller as erudite as Littell is….I read about writers like Joan Didion, who doesn’t want to read anybody’s book while working because it will pollute her own sense of style. I’ve never had that particular sense of anxiety. I didn’t do any homework, I had my plot, it has thriller elements, but it’s not about the thrills or the violence. When I was girding my loins to write Couples I did do some background reading– Les Liasons Dangerueses, and Goethe’s Elective Affinities – they seemed to be in the same sexual feed as swapping -- that way you try to prime yourself for it by reading a class. Q: I sense an increasing amount of biographical research – not to mention the actual reviewing of biography. Do you ever feel the slightest twinge of guilt, with the idea that maybe someone reviewing, say, a re-released lost classic edition of, say, Of the Farm, will be drudging around in a biography of you? A: You try not to think about your own biography. I’ve done everything I can to discourage it -- but I have had a few feelers. Being a fiction writer you turn to fiction because you don’t want to write your own biography, you try to make more of your own inner life, as I say in the long essay. And there is this frightening tendency to get things wrong -- this from people who know more work and my facts pretty well! I think you just have to die before they come to you, and maybe I am not of enough importance. I’ve written an autobiography after all. But I was struck by how much I had contributed – there’s close to 100 pages of it. They are books that are fairly easy to read, and you are interested in how other writers have lived. It’s an odd kind of prurience. Q: I recall reading about you offloading some of your reviewing library of the past forty years recently – do you ever miss those books or have they made room for more? A: You would know better than I that there is no ending of books. That was just my wife’s attempt to keep an orderly house. I’ve actually had to go back to stashing a few books in the barn, because the shelves here are full. I love books, but I don’t love them enough to constantly order and reshuffle them. My own books have grown frighteningly – I just remember when it was a tidy little shelf the Carpenter’s Hen, The Poorhouse Fair, Rabbit, Run, Pigeon Feather and the Centaur, that’s what five titles? And those early books are the ones that seem to get assigned in classes, and I could have stopped then with no detriment, but now the shelf is long and it’s a storage problem. I do miss sometimes those books that were given away – you never know when you are going to need a book, even when you are a fiction writer…in a way it’s cruel to make authors cull. Q: In Picked Up Pieces, you had a piece on The Future of The Novel…if you had to give a similar address on the future of the book review, what might it be? A: Oh, well certain outlets, like the Saturday Review of Literature, which used to be a magazine devoted entirely to books is long gone. I would think as the interest in books ebbs, so would the demand for book reviews ebb. A number of newspapers have seen fit to eliminate the books page, novel means new and they used to be real news. Books like Grapes of Wrath, and Main Street and Babbitt affected the general culture, even people who didn’t read them felt them. It’s hard to think of too many books which do that now. I would say there is a general loss of intensity, too. The thorough put down you used to see is fairly rare now. Christopher Hitchens and James Wood still do it every now and then. I am speaking as an elderly man, keep-in-mind, but there is a sense of fatigue in the book review as a genre…the books keep coming, but why do they keep coming? That’s a rather offhand answer, but things go in cycles. My feeling of the book business is it’s on the decline, but there is an irreducible number of people who still find benefits and pleasures in reading that they can get nowhere else, and it is nonetheless an art very wroth practicing. I am so happy I’ve had a life lived in books. Q: Speaking of which, I know you deliver a new manuscript every time a new book’s out the door – what’s next? Poetry? A: I’ve always felt an obligation to my publisher to have a novel every other book, so the next book will be a novel – a sequel called The Widows of Eastwick. It seems to be sequels seasons – they seem to be in, even in the authorial business. The book stays in my mind, and I thought 25 years after writing it I could revisit the characters and find something new. 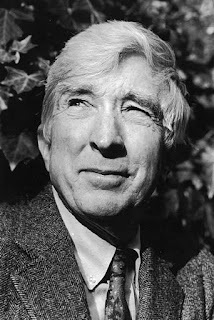 "Q&A: John Updike on Reviewing" was posted October 25, 2007.